Traditional medicine has always valued dill for its beneficial properties. Dill is a medicinal plant whose seeds, leaves, and twigs equally possess healing properties. Along with the tart taste and delicious aroma, dill possesses such substances as flavonoids, monoterpenes (they are able to fight cancerous tumors), amino acids, and minerals. So what exactly are the healing properties of dill? 1. Dill has a beneficial effect on digestion. Essential oils contained in dill, contribute to the secretion of bile, thereby helping the digestive processes. Dill can help with stomach pains. 2. Dill helps with insomnia. Flavonoids and group B vitamins in dill have a soothing effect on our nervous system which happens through the secretion of hormones and enzymes in our body. Dill helps with sleep, so people with nervous system disorders should consume dill regularly. 3. Dill can fight dysentery due to essential oils which can successfully disinfect and suppress infectious foci. 4. Dill helps alleviate diarrhea which occurs from the indigestion and infection. Dill soothes irritated intestines, normalizes the stool, and essential oils fight microbial infection. 5. 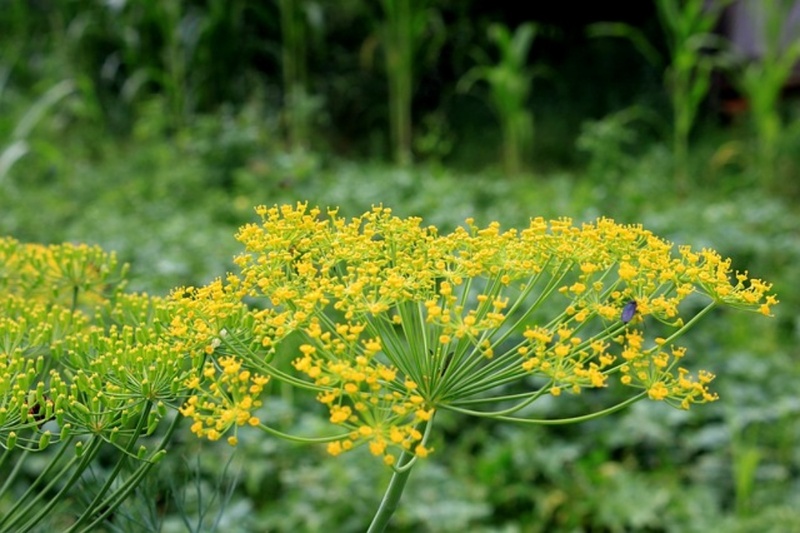 The fight against respiratory diseases is also in the competence of dill. Antihistamines are the properties of monoterpenes and flavonoids (kaempferol), which cleanse the respiratory system if you have allergies. 6. A dill compress can help with sore eyes. You can make the compress by using dill seeds immersed in boiling water for 2 minutes. Place cold to warm bags on closed eyelids. Within 20 minutes you will feel fatigue and inflammation disappear. Dill can also be used to treat mimic wrinkles around the eyes, because it smooths and refreshes the skins surface. 7. The essential oils contained in dill are involved in the secretion of certain hormones, including those which regulate the menstrual cycle. 8. The seeds and leaves of dill are used to refresh your mouth due to the presence of essential oils. Aromatic substances possess antimicrobial and antioxidant properties. The essential oils in dill fight microbes in the mouth, as well as damage to the gums and the teeth caused by free radical compounds. 9. Recent studies have shown that monoterpenes, included in the composition of dill, help in the prevention of cancer. Due to monoterpenes the secretion of a enzyme called «glutathione-S-transferase» is activated, thus neutralizing carcinogenic substances. 10. Arginine, present in dill, increases libido, strengthens bones and teeth, and can even help with hiccups due to calcium. As you can see dill is not just a culinary spice, but a powerful healing agent. Eat fresh dill, or prepare meals using fresh, dried or frozen dill. You will not be disappointed!